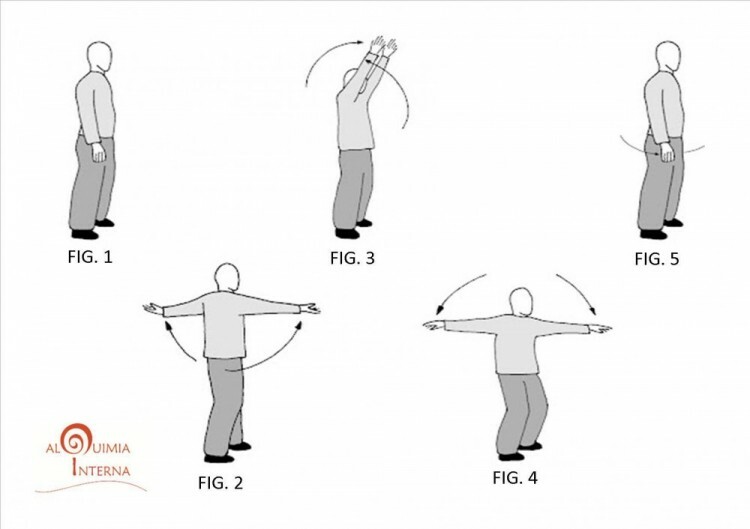 With this simple exercise Qigong energy distribution and promotes blood, undoing locks and dispersing stagnation. Also find relax muscle tension and soothe altered emotional states. To achieve these results, movements that make the exercise must be fluent, relaxed, slow and uniform. FIG. 1.- Start the exercise with legs spread shoulder width, knees slightly bent and arms relaxed at your sides. FIG. 2.- Inspiring, legs stretched his arms raised (one ahead of and one behind body) with palms facing up. FIG. 3.- When the legs are stretched, the arms are on the head and palms facing. FIG. 4.- Exhaling, continues the circle. Now the arm that went up behind the front lower, and coming up ahead down the back. The palms now look down, while the legs are flexed slightly. FIG. 5.- Repeat the exercise a few times in one direction and then the other. Inhaling and exhaling to climbing down.